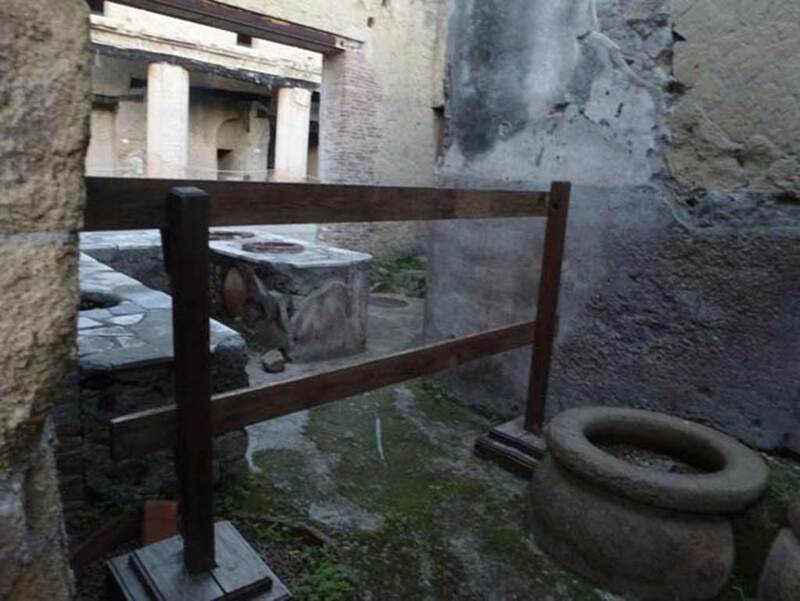 Herculaneum V.9. Linked to V.10. 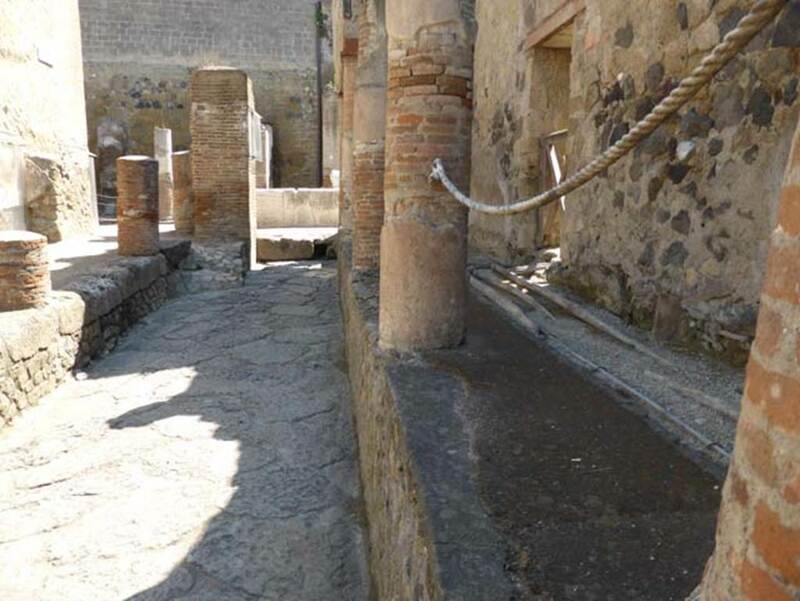 V, Herculaneum, September 2015. Doorway at V.9 on the left. 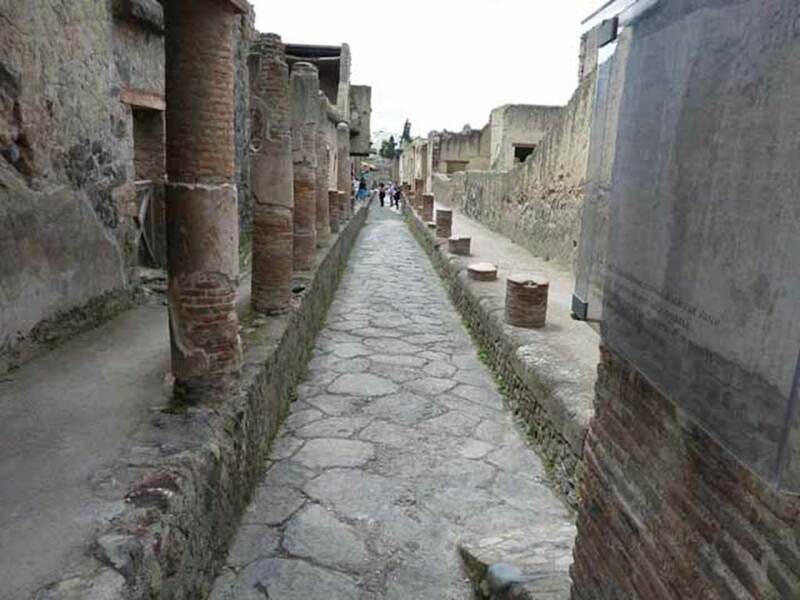 Looking south along Cardo IV Superiore, from junction with Decumanus Maximus. 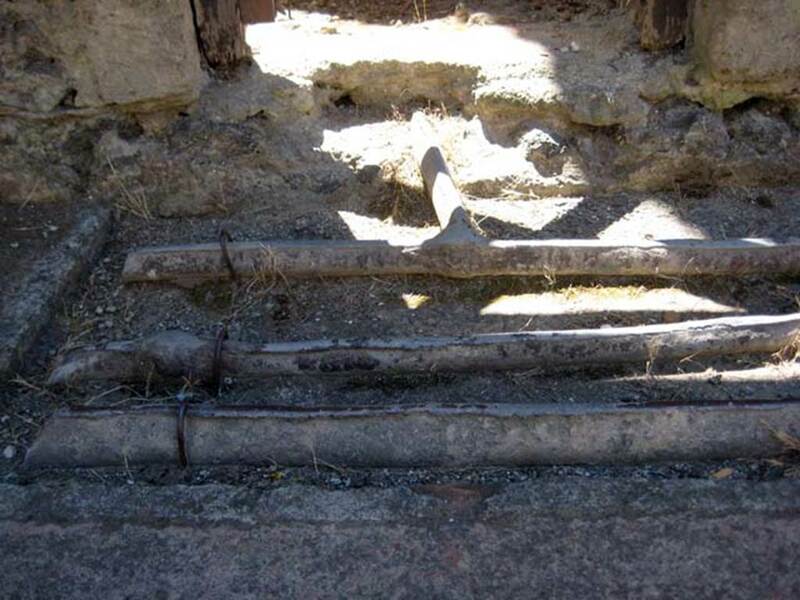 V, Herculaneum, June 2011. Doorway at V.9 on the left. V.9 Herculaneum, September 2016. Looking east to entrance doorway. Photo courtesy of Michael Binns. 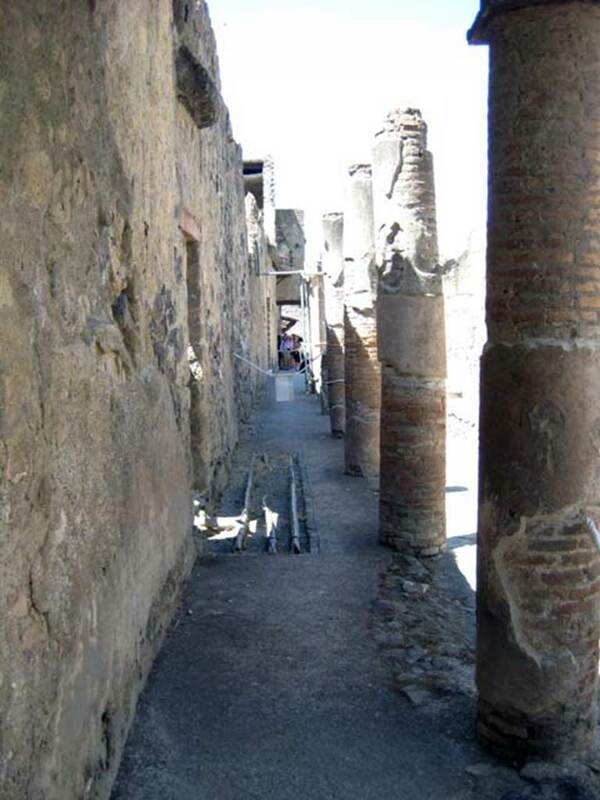 V.9 Herculaneum. February 2007. Looking east to entrance doorway. V.9 Herculaneum, October 2012. Entrance doorway. Photo courtesy of Michael Binns. V.9 Herculaneum, October 2012. Looking through doorway into rear room. Photo courtesy of Michael Binns. 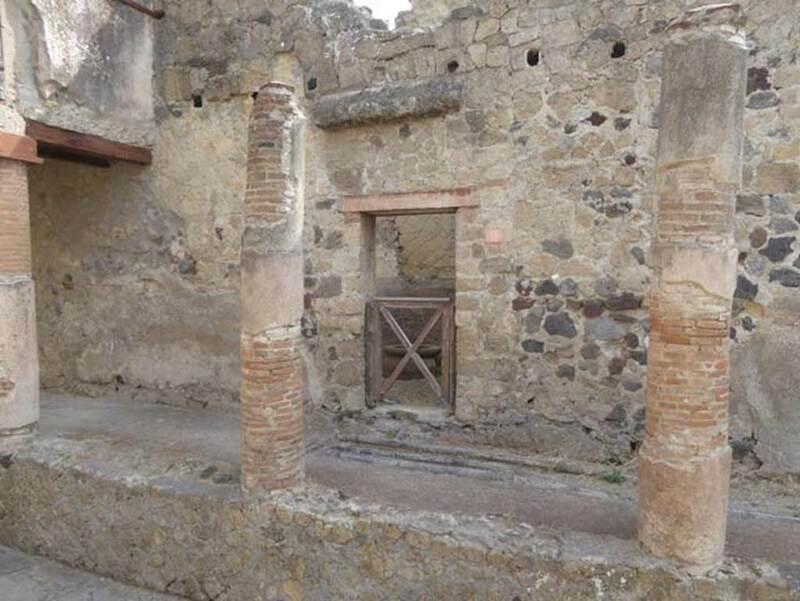 V.9 Herculaneum. December 2004. 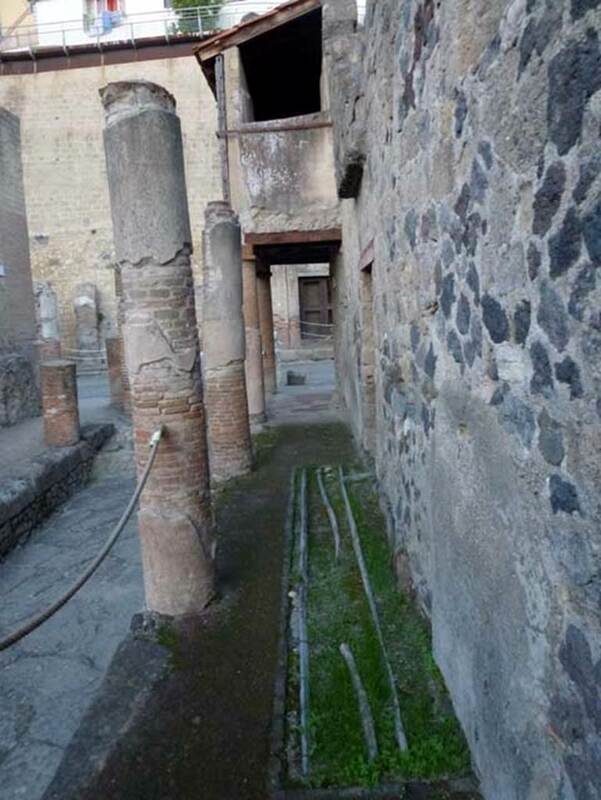 Looking north from rear room across shop-room towards Decumanus Maximus. 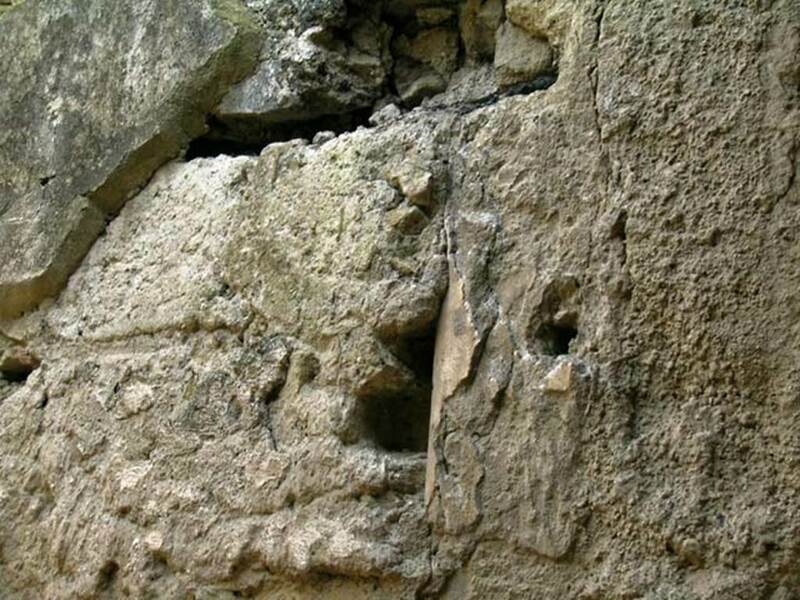 The rear doorway to Cardo IV, is on the left. Photo courtesy of Nicolas Monteix. 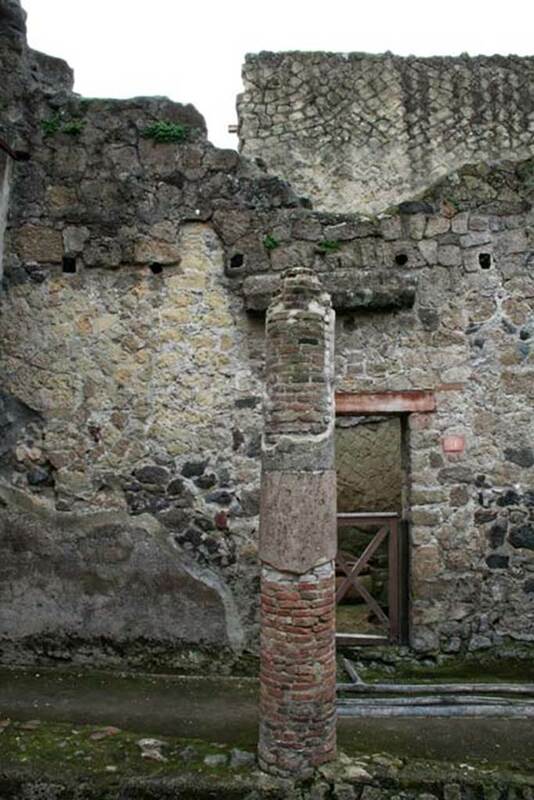 V.9/10, Herculaneum. December 2004. Looking towards south-east wall in rear room. Photo courtesy of Nicolas Monteix. 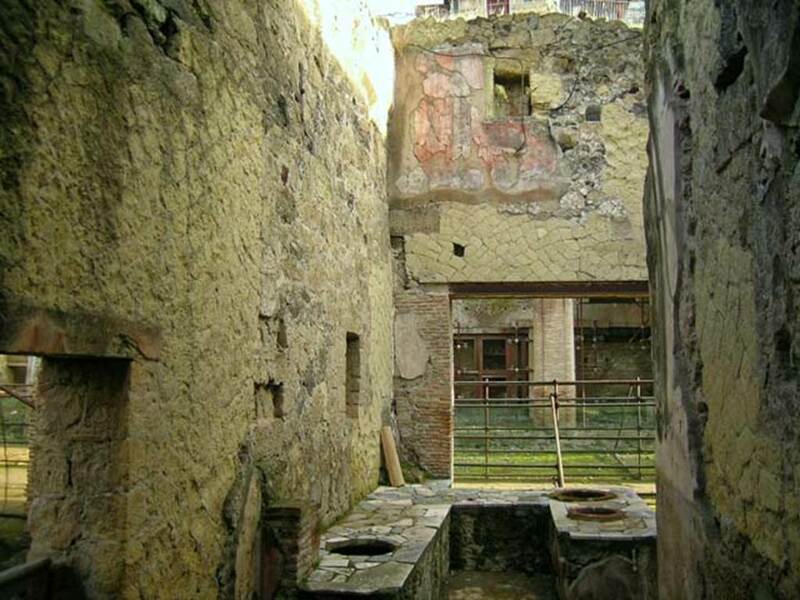 V.9/10, Herculaneum. December 2004. Detail from south-east wall in rear room. Photo courtesy of Nicolas Monteix. 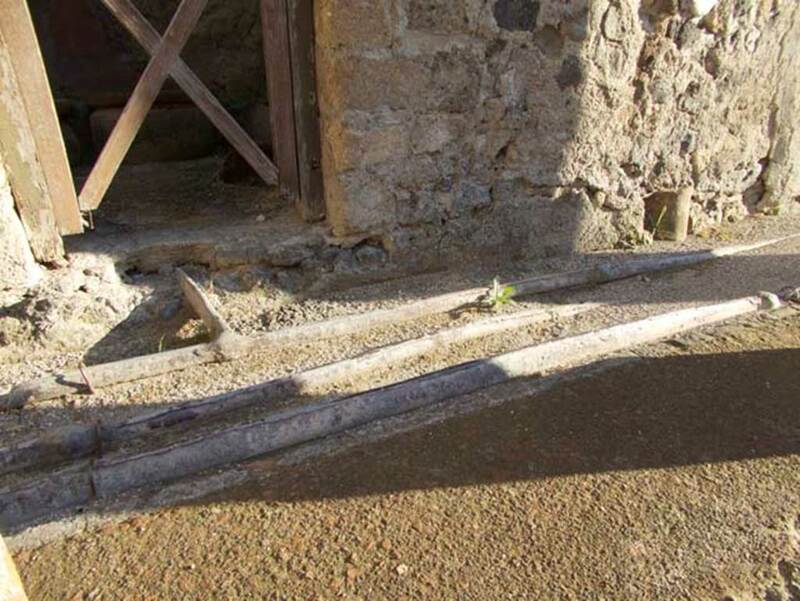 V.9 Herculaneum, September 2015. 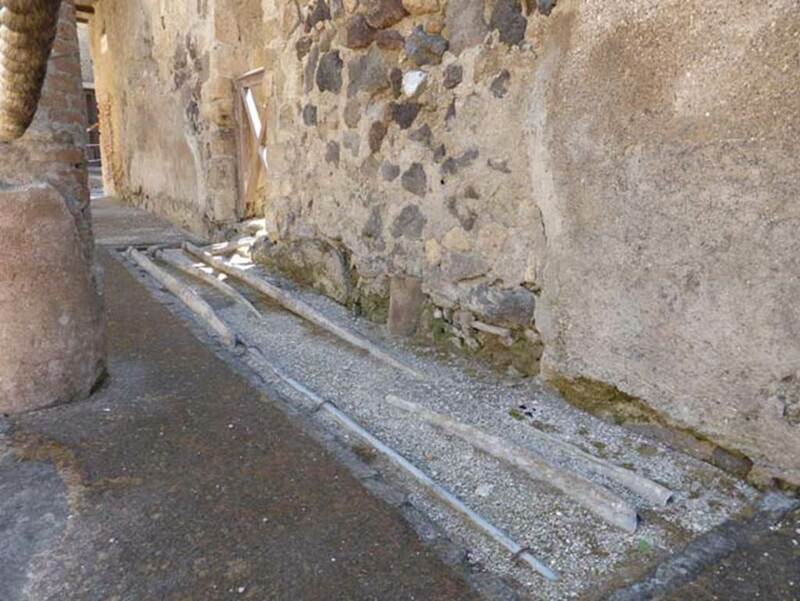 Looking east to doorway, across line of lead pipes in pavement. V.9 Herculaneum, June 2011. Looking east to doorway, across line of lead pipes in pavement. V.9 Herculaneum, June 2011. 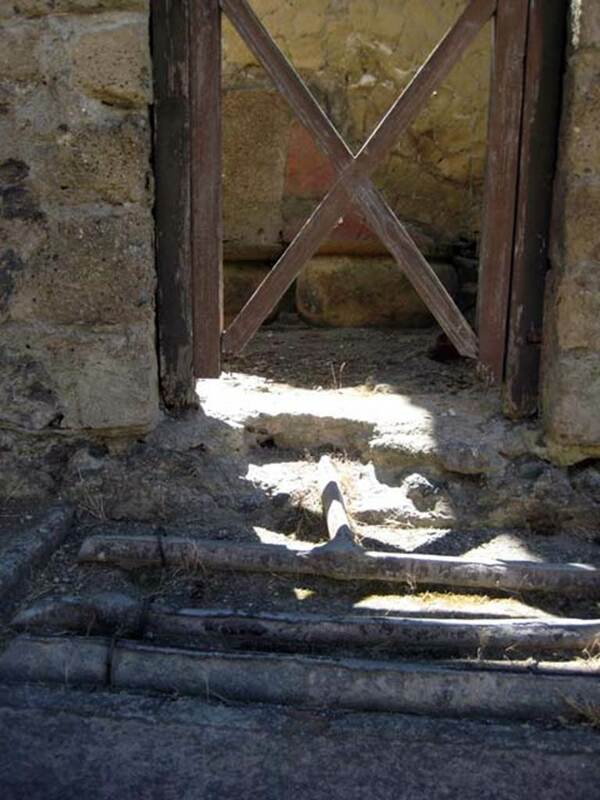 Detail of lead pipes in pavement outside doorway, looking east. V.9 Herculaneum, October 2012. Looking south along line of lead pipes in pavement. 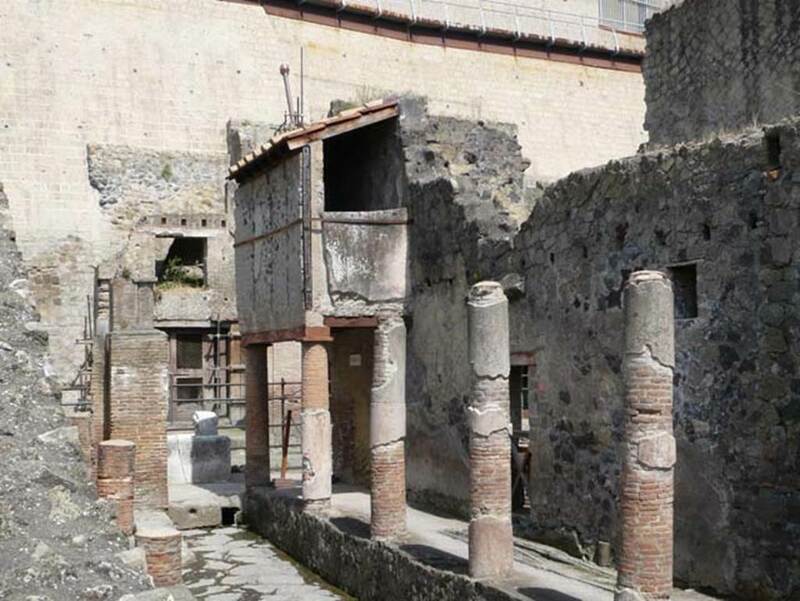 V.9 Herculaneum, June 2014. 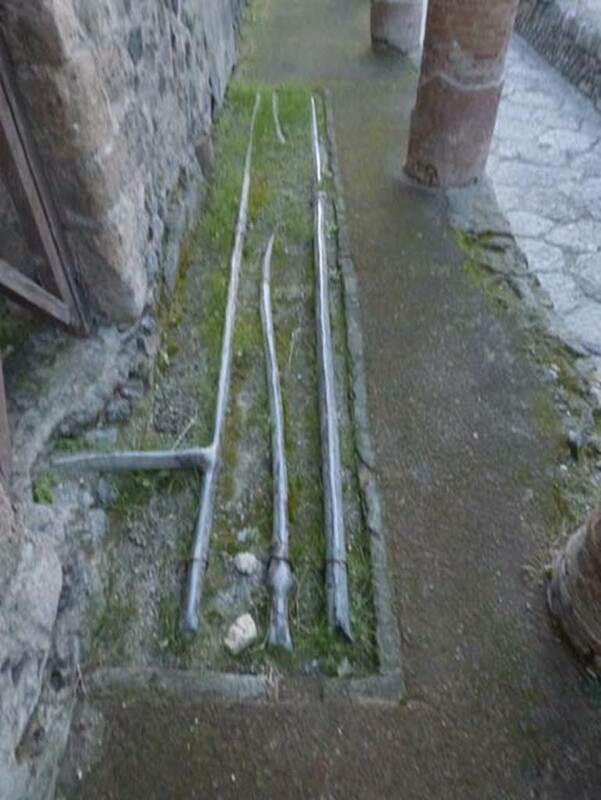 Looking north towards doorway, with lead pipes in pavement. 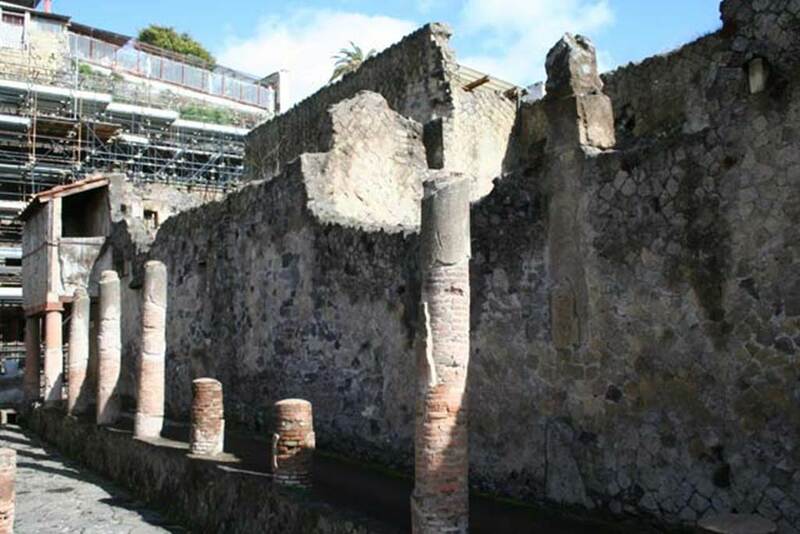 V.9 Herculaneum, on right. June 2014. North end of Cardo IV Superiore, looking north towards Decumanus Maximus. V.9 Herculaneum, October 2012. Looking north on Cardo IV Superiore. 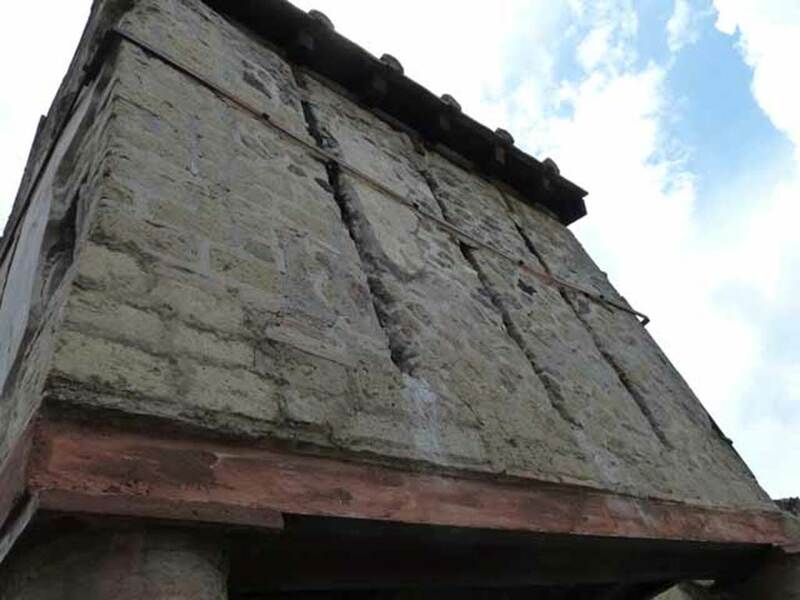 V.9 (doorway) and V.11 (side wall), Herculaneum. May 2010. North-west corner of insula V, from Cardo IV Superiore. 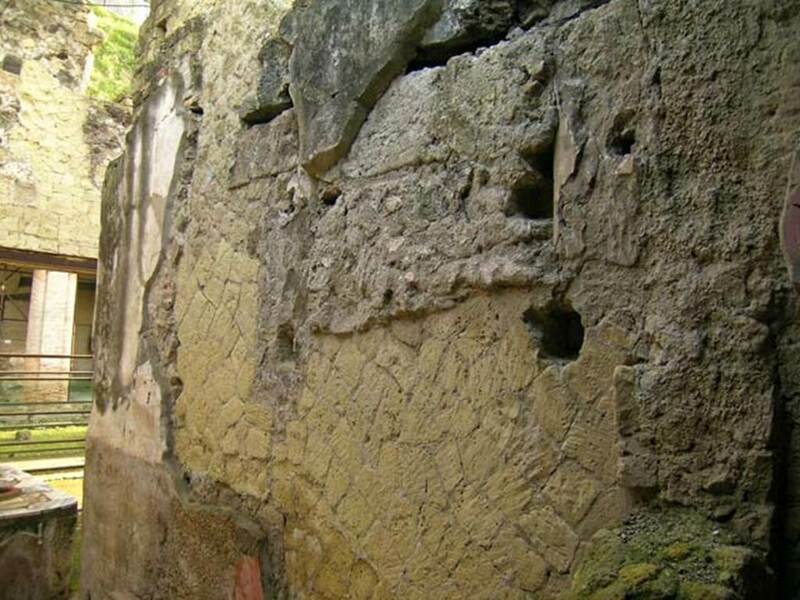 V.9 on left, and V.11 (side wall), Herculaneum. March 2008. North-west corner of insula V, from Cardo IV Superiore. 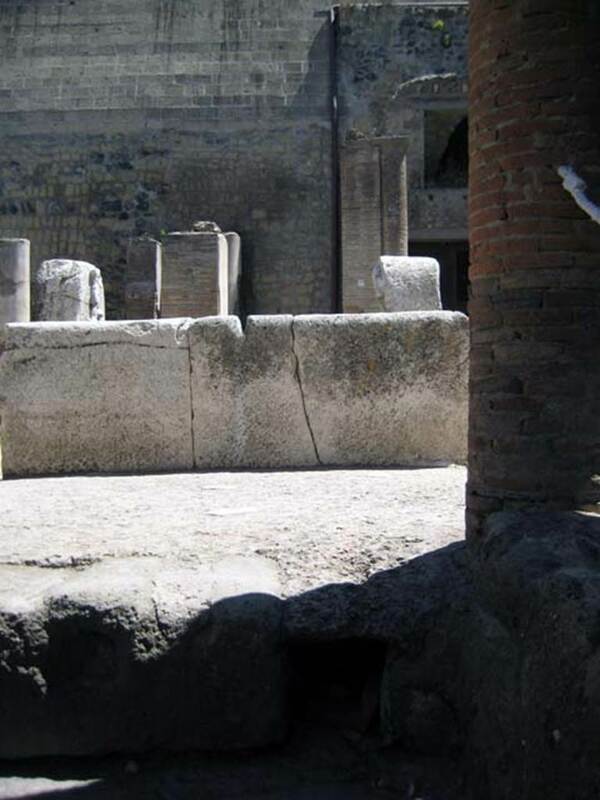 V.9 (doorway on right of centre), Herculaneum. May 2009. Looking north from Cardo IV Superiore. 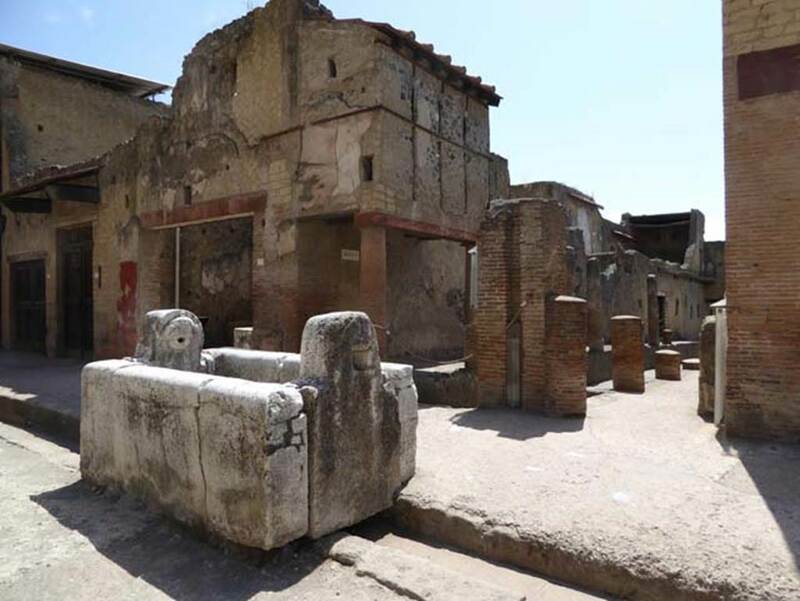 V.10/9 Herculaneum. May 2010. Upper floor of portico on north-west corner of junction with Decumanus Maximus. V.10/9 on right behind fountain. July 2015. Looking south-east from Decumanus Maximus. Photo courtesy of Michael Binns. V. Herculaneum, May 2010. Looking east across junction of Cardo IV Superiore, towards Ins. V from rear of the water tower. Doorway at V.9 can be seen on the right of the water tower, in the centre. V.9 on left, with Ins. 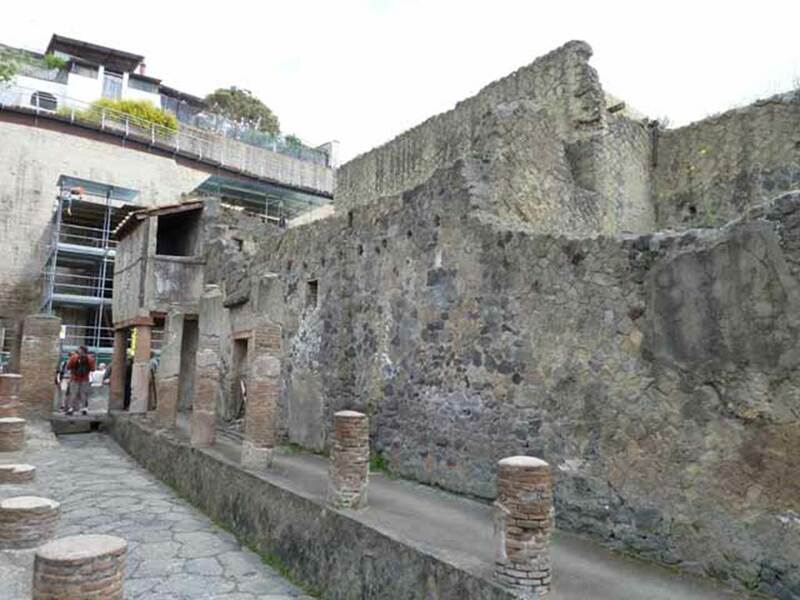 VI on upper right, Herculaneum. May 2010. 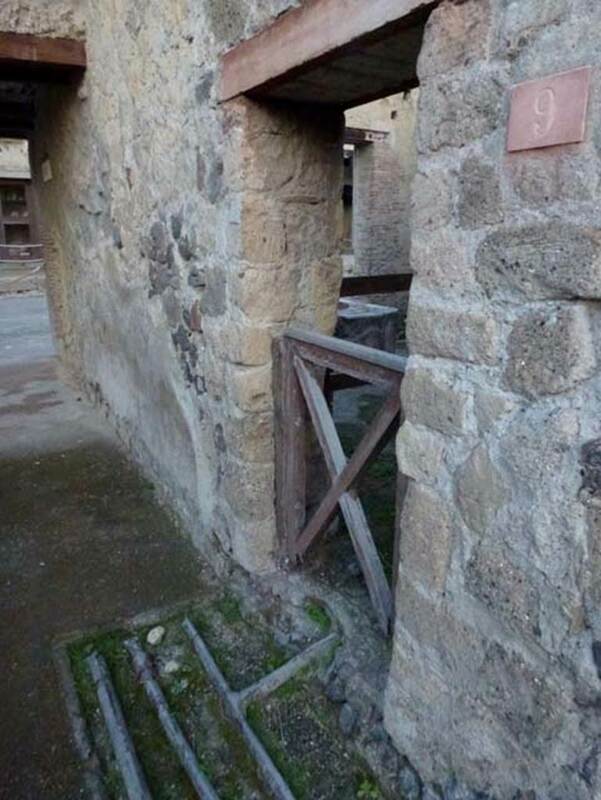 V.9, the rear doorway of V.10, can be seen on the left. On the right can be seen the graffiti painted on the water tower. 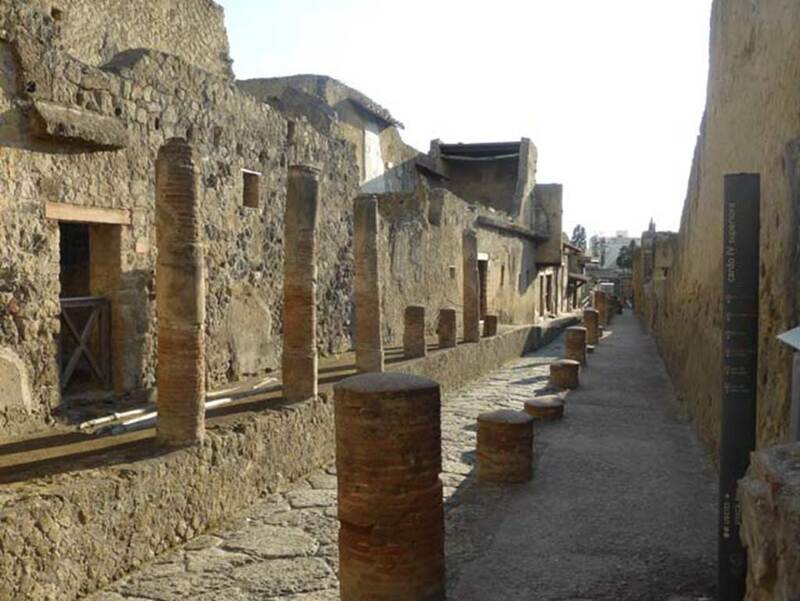 Looking north on Cardo IV, with junction of Decumanus Maximus, Herculaneum. May 2010. 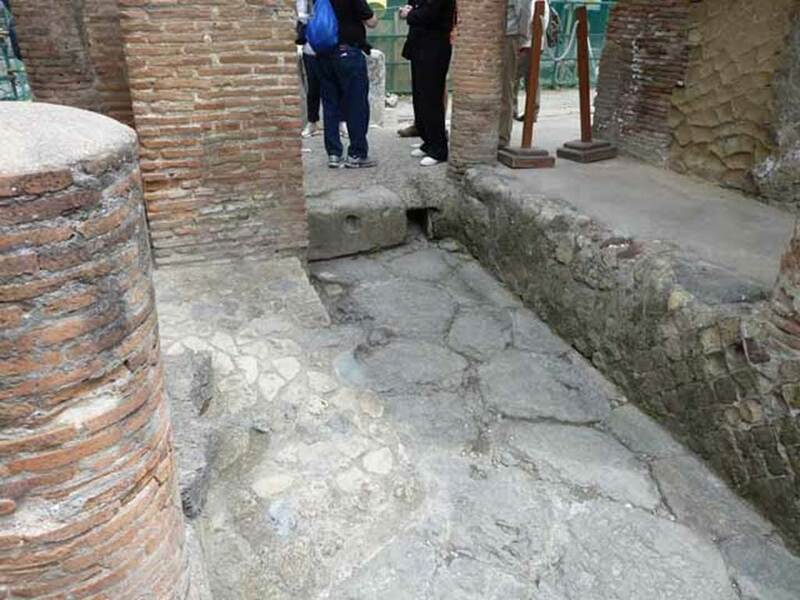 Looking north on Cardo IV, to drainage beneath junction with Decumanus Maximus, Herculaneum. June 2011. Photo courtesy of Sera Baker. 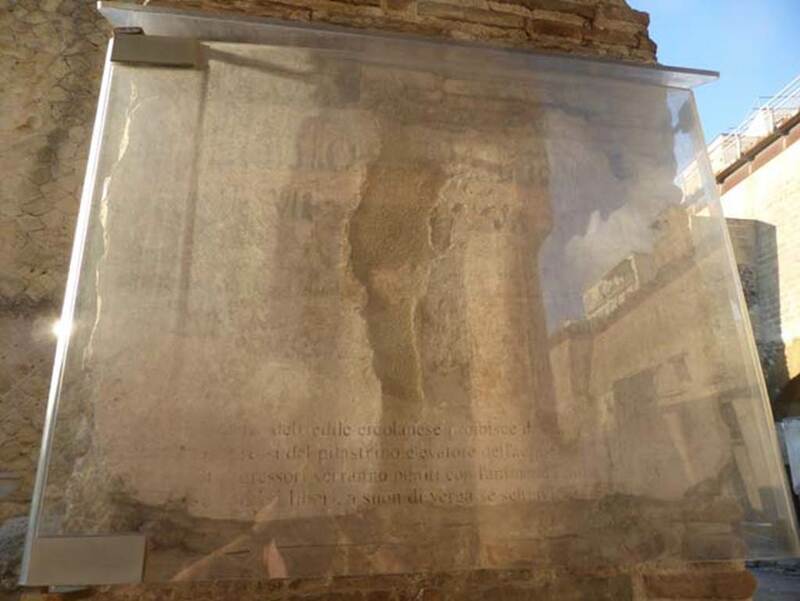 Water tower, at junction of Cardo IV Superiore and Decumanus Superiore, Herculaneum. May 2010. Painted graffito. 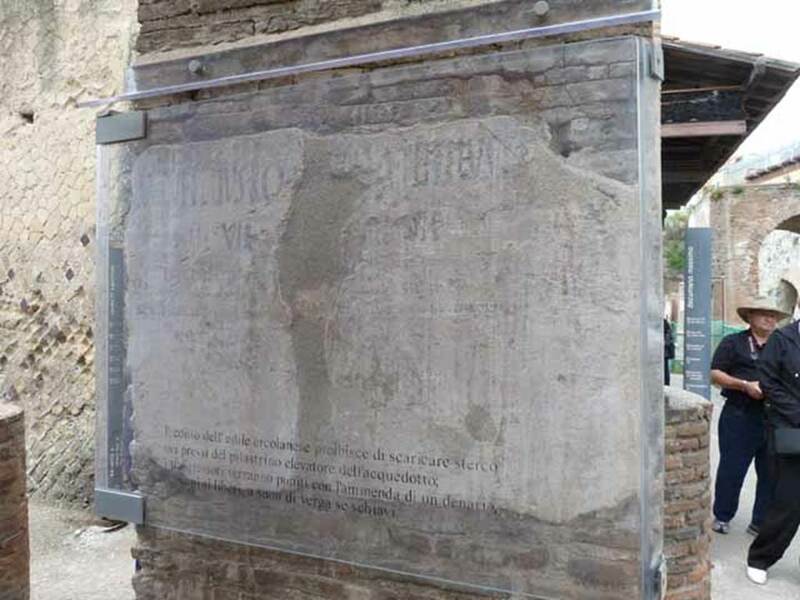 This shows the remains of a painted edict on behalf of two local aediles, M. Rufellius Robia and A. Tetteius, to prohibit the dumping of dirt and excrement near to the water tower, to prevent the pollution of the water supply. 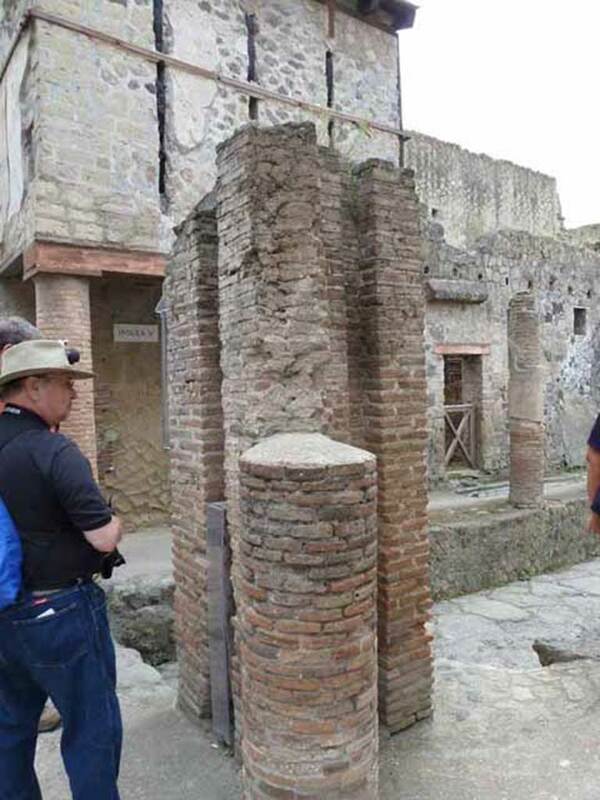 Water tower, at junction of Cardo IV Superiore and Decumanus Maximus, Herculaneum.